Michelle had an urge for meatballs in marina sauce, so I made up a batch of all beef meatballs for dinner plus extra for the next time she has a craving. We used some of the tomato sauce she canned at the end of the summer but you can use store bought sauce. You can also add a cup of red wine to the sauce but it is quite tasty without as well. If you don’t have Italian seasoning, make your own by combining the following dried spices in a bowl and crushing them together with your fingers or the back of spoon. Don’t use a spice mill, as you’d end up with a powder not a blend. Transfer blend to an airtight container until ready to use. This recipe makes about 50 golfball sized meatballs. You can make them larger, just increase the cooking the time. Or, you can do what I like and freeze what you don’t use for dinner (we used about 20 for our meal for three and that used up all the marina sauce, too). Saute the onions in the olive oil in a large skillet over medium heat for 10-15 minutes, or until they are softened and golden. Add in the garlic and seasoning and cook, stirring regularly, for about 5 minutes more, until the mixture is fragrant. Transfer half of the onion mix to a large mixing bowl to cool slightly for use in the meatballs. Add tomato sauce and diced tomatoes to skillet with remaining amount of onions. Simmer over low heat for 45 minutes to an hour to thicken. You can add 1 cup of red wine here, too. Once thickened, add basil. Stir and taste for seasoning. Add salt, pepper, and/or sugar if desired. I find it doesn’t need any additional seasoning. While the sauce is simmering, make the meatballs. In a separate bowl, tear the bread into small pieces and pour the milk over it. Let stand for 2 minutes before mashing with a fork into the reserved onion mixture. Add parmesan, egg, garlic and seasonings and stir thoroughly to combine. Add in the beef and gently mix together with your hands. Form into golfball sized meat balls. 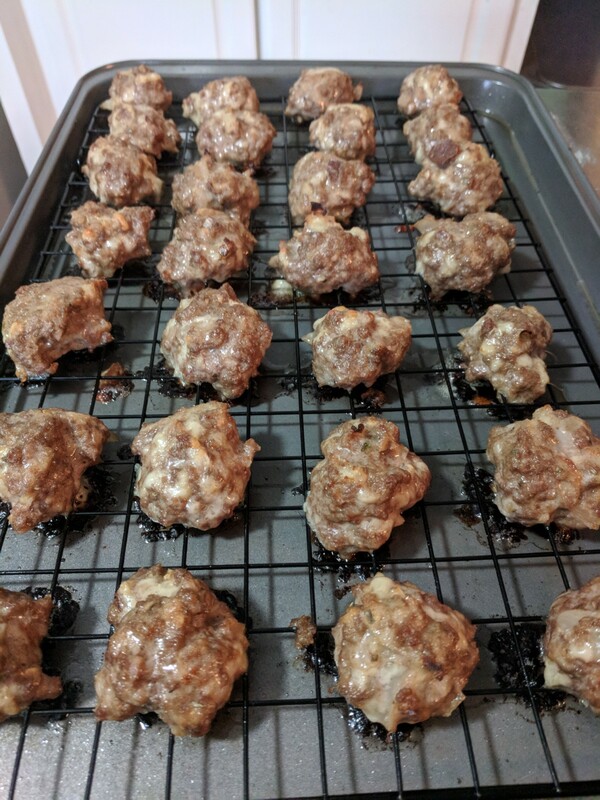 Place meatballs on a rack over a rimmed baking sheet. Bake in a preheated 400 degree F oven until browned, about 20-25 minutes. At this stage, you can cool the meatballs completely before freezing for later use. Store in the freezer, in an airtight, zip top bag. 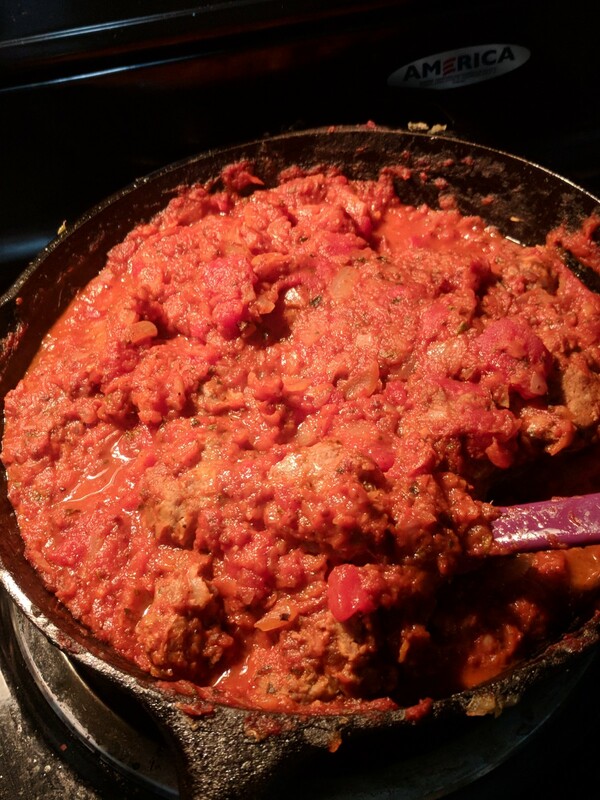 Place browned meatballs in sauce until skillet is full and cook until done, about 15 minutes. Serve as is, over spaghetti or pile onto a roll for an awesome meatball poboy/hoagie/sub (whatever you call it, its good! ).